The last 6M race on 15th November. Herewith pictures I hope. Hugh,s new boat is No 46. 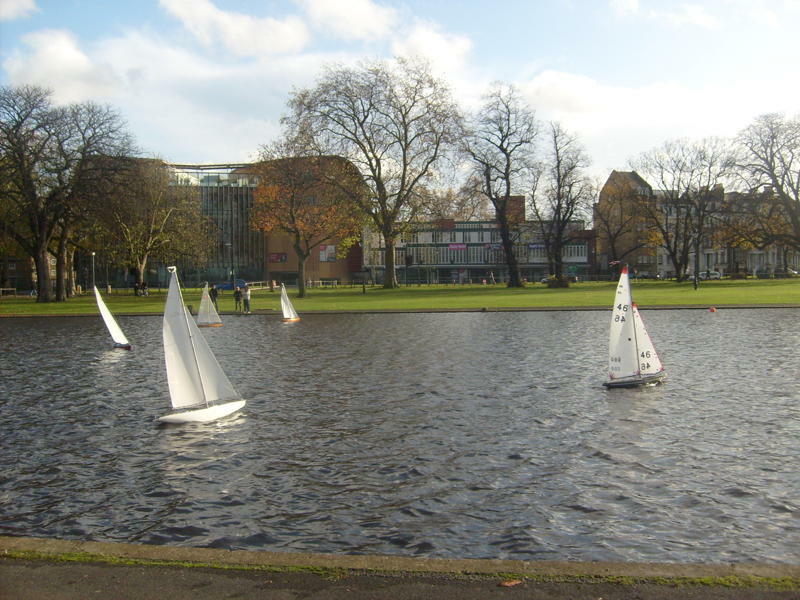 Sailing at Clapham on 15th November. After a day of gales and heavy rain on Saturday it was surprising to find that Sunday dawned fine and sunny with only a moderate breeze. It was a 6M racing day and one or two boats ventured onto the water to test the strength of the wind, which turned out to be just right giving some exciting sailing. After some delay Hugh set out the buoys and we started racing, seven skippers sharing six boats, Leslie and Hugh sailing Hugh,s new boat “Rococo” and John T sailing Derek,s second boat. I think John S sailed Ted,s boat for some part of the day. 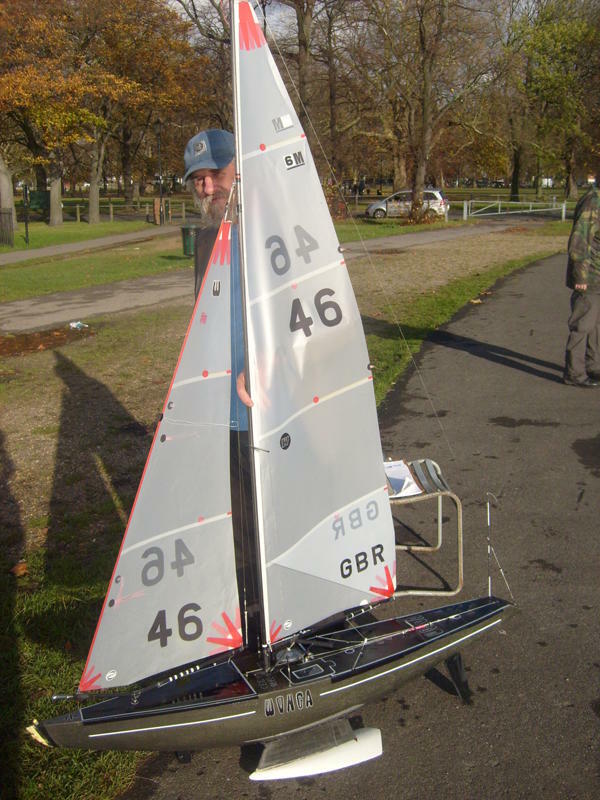 Hugh,s boat sails very well and proved the boat to beat, but it can be beaten as the results show. Derek,s second boat in the hands of John T did not perform well at all untill Jim was asked to tune the rig whereafter it performed much better, and after a few more tweeks it was able to keep up with the rest. We managed to get eight races in during the day with Hugh,s boat being the overall winner. Race six was very close, being declared a dead heat between Jim and Leslie. 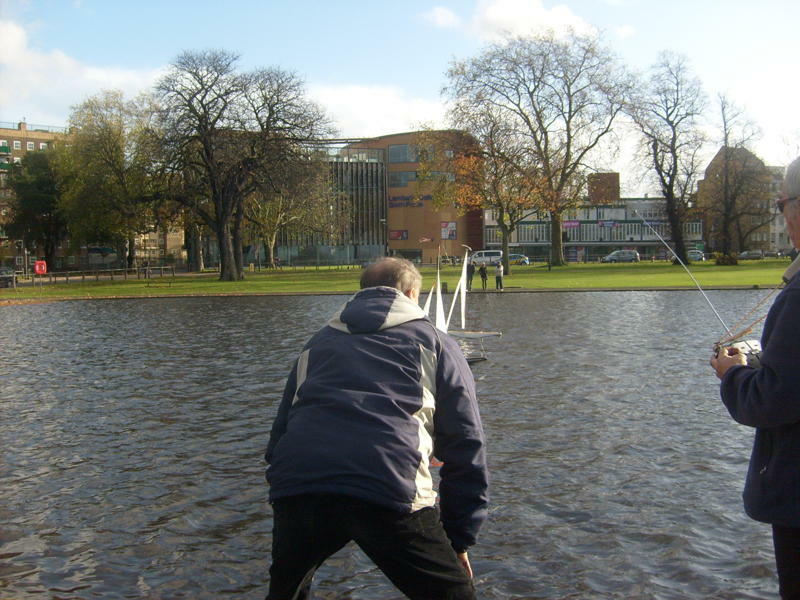 We managed to get several photographs, with one showing Ted acting as umpire at the finish of race six, unfortunately it shows more of Ted,s bum than it does of the boats. I shall try to download the photos to the blog site, but this will be my first attempt at such a transfer so wish me luck. Race 1. Leslie, Derek, Ted. Race 2. Leslie, Jim, Derek. Race 3. Ted, Leslie, Jim. Race 4. Leslie, Derek, Jim. Race 5. Leslie, Ted, Jim. Race 6. Dead heat Jim/Leslie, third, Derek. 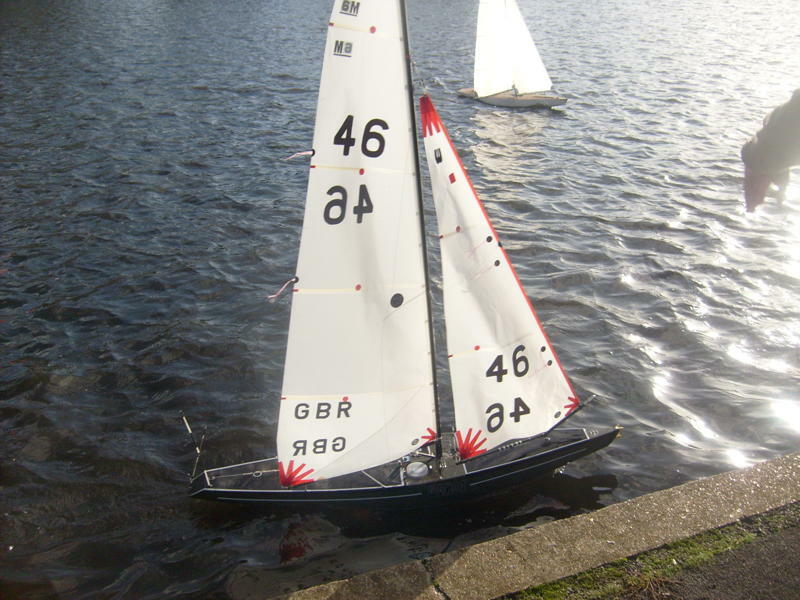 race 8. Jim, Derek, John T.
I shall now attempt to download the photo,s, Hugh,s boat is the blue one, number 46. Derek. 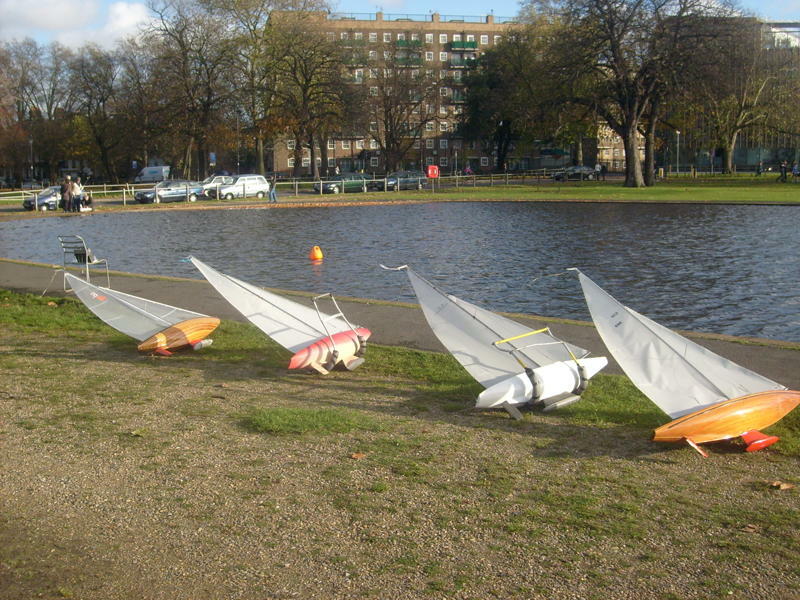 Sailing day at Clapham on 1st November. As I write this it is brilliant sunshine and calm winds outside, but this is Monday! The sailing day yesterday was horrible. Heavy winds and pouring rain. 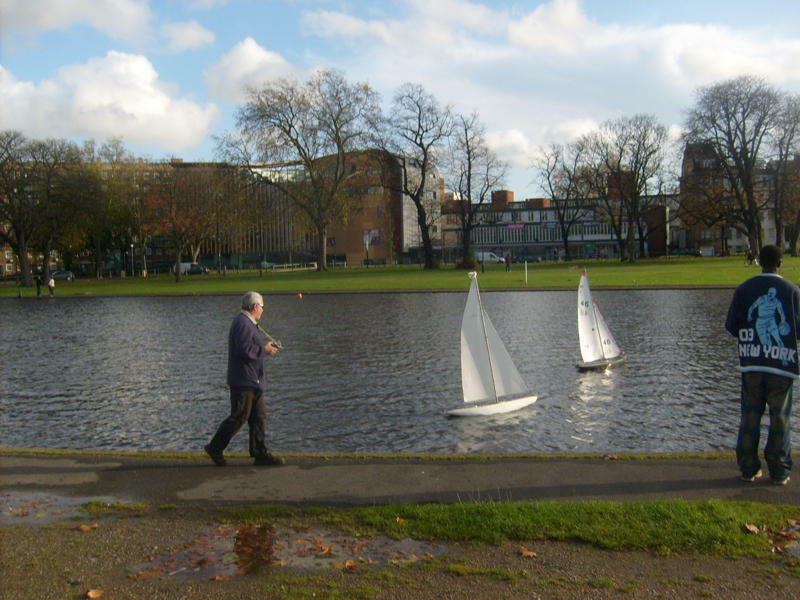 Very few turned up (5) , and while Hugh was ready to sail the others thought it too wet and windy. As a sailing day it was a non starter and we all left the pond early. Hopefully the next meeting date, the 15th November, will be much better for the 6M,s. Talking of 6M,s, having had a look at Hugh,s new boat we have noticed that it has two rudders!, one in the conventional place at the back of the boat but another at the rear edge of the fin, both appearing to be controllable independently. This must surely be an advantage and might allow the boat to sail closer to the wind. I assume this is within the rules as the boat is said to have highly placed in competion. Perhaps we shall now see the Club,s fleet similarly uodated? 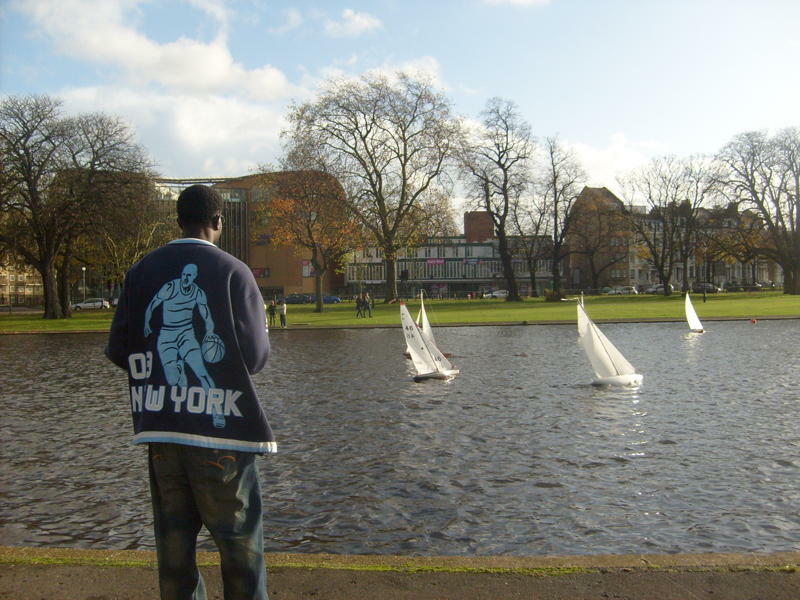 I have set the Club,s AGM for the last Sunday in November, the 29th at 11am. Hope to see you all there. Derek.